Looking for running shoes and accessories that won't break your budget? Brooks has you covered with a variety of sale items across our massive range of running shoes and clothing. Whether you're on the hunt for affordable women's running shoes or you want to score a bargain on men's running clothing, you'll find all of our current sale products on this page. While 'cheap' and 'high-quality' aren't words that are often used together in the same sentence, our on-sale women's shoes break the rules. Our cheap yet high-quality range includes a variety of different running shoes that are designed to provide you with the best possible experience. Our bargain men's shoes range includes numerous shoe types and styles for you to choose from. Available at fantastic prices, our sale items give you the opportunity to score a great deal that's sure to put an added spring in your step! After spending money on a pair of high-quality running shoes, we understand that you might be looking to save some money on running clothing. If you're after affordable options that don't compromise on quality, check out our incredible range. We have everything you need for raising a sweat without raising a debt! 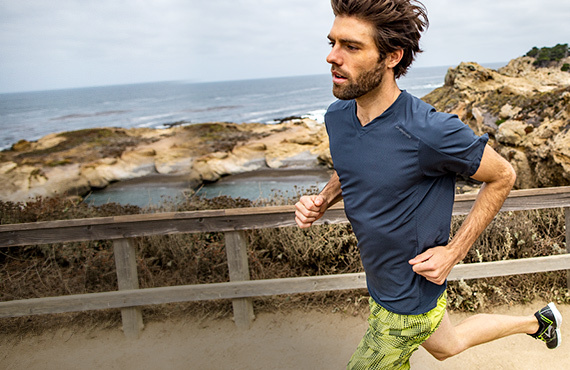 Our men's clothing sale range includes a variety of men's running clothing and accessories, with bold colours, smart designs and lightweight qualities to help you run happy - and affordably!